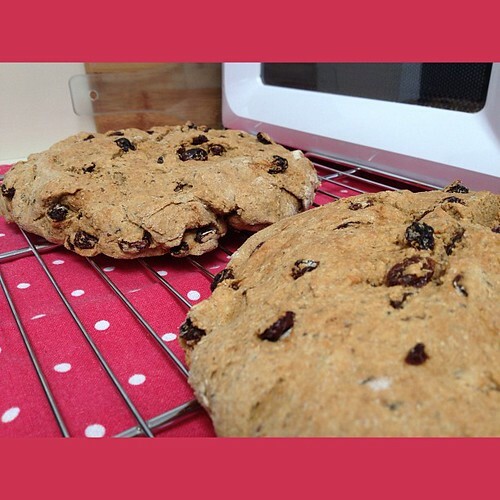 Vegan Irish Soda Bread - 2013-074, originally uploaded by Judi FitzPatrick Studio. The last time I made this bread, I was vegetarian but not vegan. I substituted soy milk (because that kind was open) with a little acid (used vinegar because that is what I had) for the buttermilk, and some ground flax seed meal for the egg. I'll be bringing it to a party, so can't taste it just yet - hope it is as good as, or even better than, the original recipe. And if you partake in adult beverages, green beer or otherwise, please do so responsibly. It came out quite tasty, I couldn't tell the difference.